Another Facebook “friend” (also an actual friend) found this, in another part of Facebook. 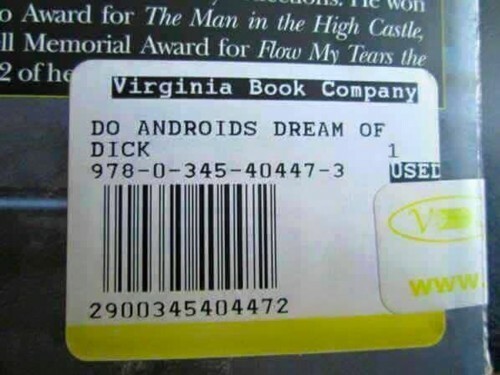 I don’t know the answer. Let’s ask this guy. NASA took the photos, but it was Sean Doran and Brian Swift who spotted the dolphin and “visual artist and citizen scientist” Doran then Tweeted it. I’m guessing that this dolphin is not a permanent fixture, but an accident of cloud formation. I’m guessing it will soon be gone. But what do I know? About dolphins. 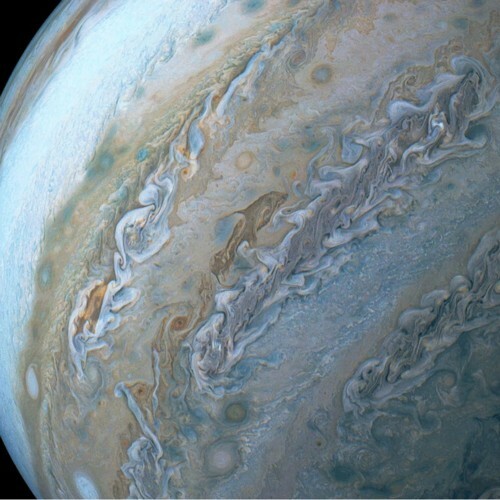 On Jupiter. Or anywhere. See also, these two galaxies, which resemble a penguin looking after its egg. Incoming from Rob Fisher: link to a piece in the Independent, about machine learning applied to old telescope data is finding new planets. A computer was trained to look through the data from the Kepler space telescope, and look for signals that might belong to planets. And it found new planets within existing systems, by spotting signals that seemed to indicate something of interest but were too weak to have been spotted by humans. That suggests that there might be whole worlds and solar systems hiding within the data we’ve already collected, but which we had not noticed because there are simply so many signals to pick through. Kepler has collected four-years of data from looking at the sky and 150,000 stars – far more than humans could ever look through. So, exactly what were these weak signals? The new planets – just like all of the thousands found by Kepler – were spotted by watching the sky for light coming from the stars. When planets pass in front of their stars, scientists can register the dimming as they go, and use the speed and characteristics of that dimming to work out what the solar system might actually look like. Much of that work relies on pattern recognition, which until now has been done by scientists looking through the data. 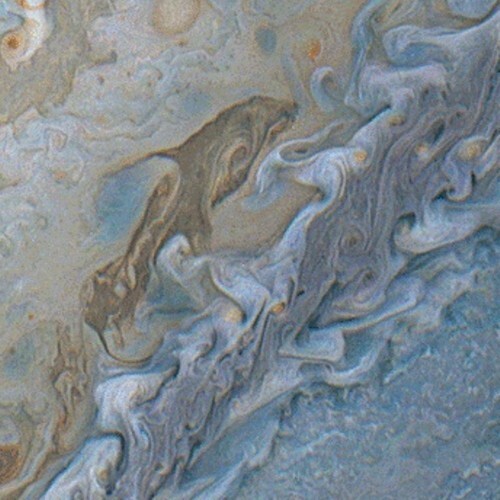 But the new findings are the result of work between Nasa and Google, which trained machine learning algorithms to learn to spot those patterns itself and so pick through the data much more quickly. This is good. Keep Skynet busy with harmless hobbies. Maybe not. Getting Skynet to compile a huge and exhaustive list of all the places in the universe where biology-based life might be, after biology-based life on this planet has been taken care of. Staff were trickling out the side door, even as I was seeing this for the first time. Can I take a closer look, just for a second? Yes, just a quick one, they said. But, look on the website, they said. Three hundred and fifty quid. As you can see there is a choice of colours. If on closer inspection (tomorrow?) I find that I like it, and that it is not too deep front-to-back, I am in the mood to take the hit. 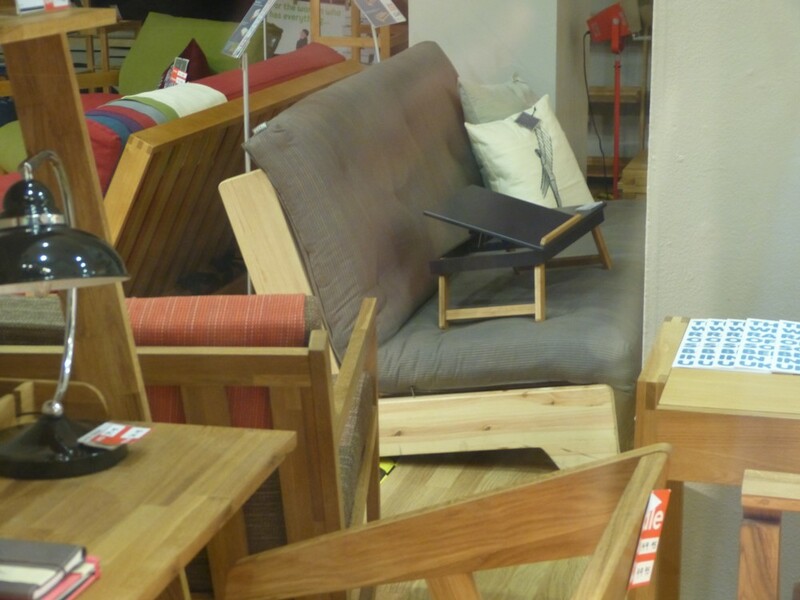 After all, a sofa is for life, not just for the next few weeks, and I think I do like it already. Deep it may be, deeper than I would like. But almost all of the other sofas I’ve looked at are hideous monster sofas with arms on them like the arms of a person starring in a television show called Embarrassing Arms. 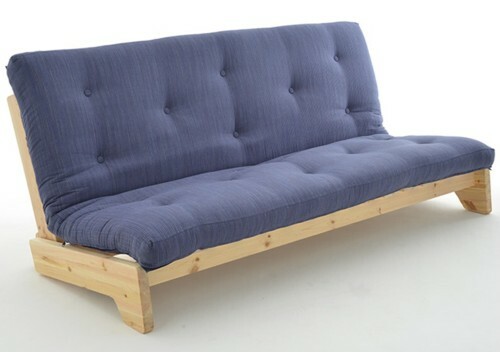 I already have a monster armed sofa like this and could not bear another. Those arms are two extra people. The question is: Can I get it up my stairs? Because of Health and Safety the people who deliver it won’t do that. How the hell does that make the world any safer? Wish me luck. If this suits, then I will win that fifty quid, in the limited sense of not having to give it to anyone else. First, the current BrianMicklethwaitDotCom endorsee for American President, Gary Johnson, being interviewed by PJTV, which you can view here. Johnson is older, thinner, duller, better dressed, more evasive, more “political” than I expected him to be, based on this. In short, not what I expect a Gary to be. I guess American Garies are not like our Garies. Plus, he is a real politician, having been a real governor of a real state. But then, I don’t expect a Gary to be a real politician. He goes on about drugs being a medical condition, rather than a choice about how to have fun which is what I think it is, a choice which may have consequences, but not criminal-law consequences unless (under the influence of drugs) you commit an actual crime, besides the non-crime of using drugs I mean. Talking about drugs as a healthcare problem legitimises all kinds of interventions and general bossing around. But still, whatever his spiel, he wants to move things in the right direction. Does Gary J have any chance? This guy says he is better than Ron Paul. Next up, a wondrously biased attack on the idea of internet neutrality, from someone called Crowder, viewable here. Finally, rocket scientist Jeff Greason, expressing optimism about space exploration, despite and because of having become totally disillusioned with NASA. About a fortnight ago, I was so impressed by this that I started writing down what Greason was saying, with a view to quoting it on Samizdata. But I never wanted to stop quoting, and gave up when something else intervened and I never got back to it. Does anyone know if the words of this performance have already been written down, to save me the bother of doing it? Do you remember when Branson was pratting about in balloons? Trying to break one of those fatuous, made up just to get into the Guinness Book of Records, records, for pratting round the world in a balloon faster than the previous prat in another balloon? When he was doing all that, I was ready to believe the worst that lefty book writers were writing about him. It was all stolen, he rips everybody off, he’s actually poor, his empire is balanced on nothing and will crash, blah blah. But now, all that could still be entirely true but I do not care, because whereas balloons were stupid, rockets are cool. More the point, rockets are great. It’s the difference between pseudo-adventure and the real thing, between doing something pointlessly dangerous, and getting seriously and helpfully involved in something that is just as dangerous but which is truly going somewhere and truly achieving something. I can’t believe I’m the only one who thinks like this about this extreme contrast. To put it another way, I think that Branson’s ballooning did nothing for the Virgin brand and maybe a minus quantity, but that these rockets are already paying for themselves many times over. 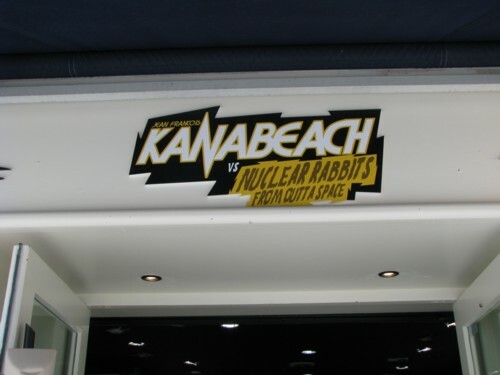 I can remember having libertarian conversations about space travel, back in the eighties and seventies. We used to fantasise about how space travel ought to be paid for, as opposed to how it was paid for (and still is mostly). And what we fantasised was: this. I particularly like the shovel in the bumper. See the picture on the left. Actually it all makes sense, despite my immediate objections on the day. 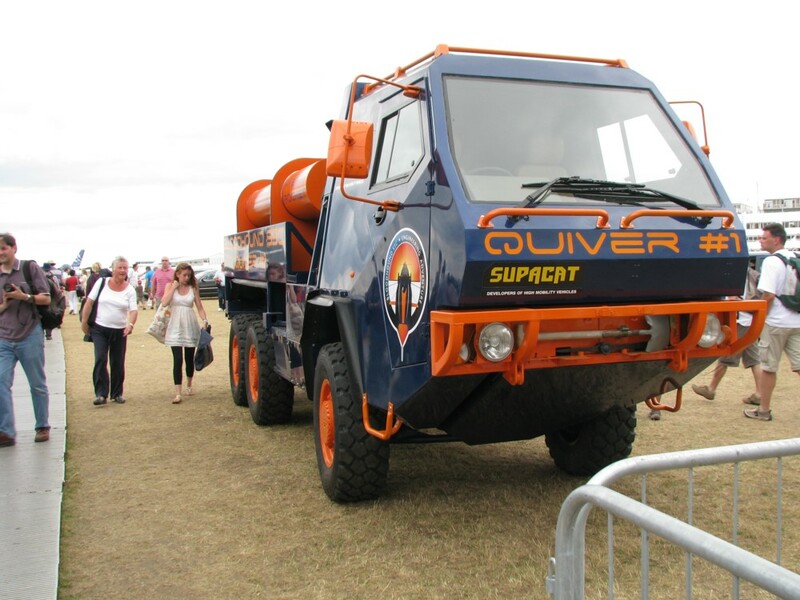 Supacat is the brand of the vehicle I photoed. 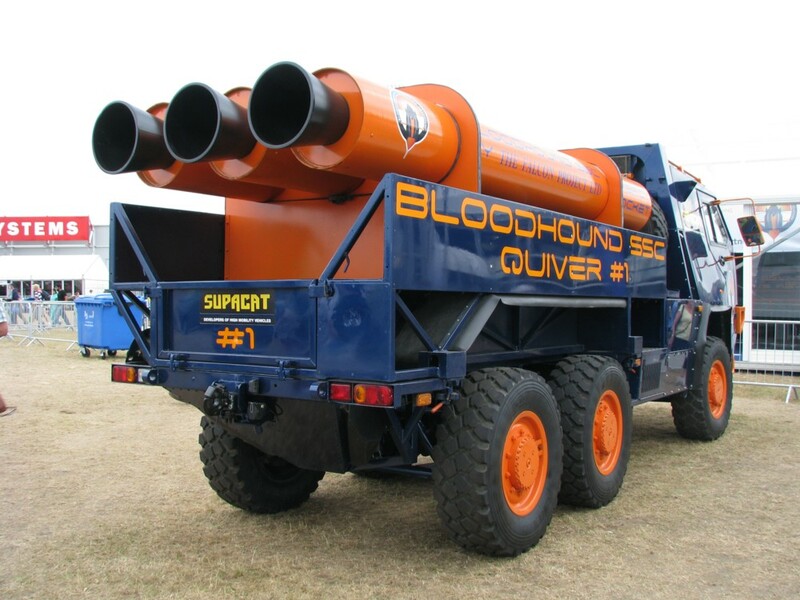 The Bloodhound is one of those spaceships with wheels that people drive across dried out lakes in America, trying to break the world land speed record. And Falcon is the name of the company that makes the rockets for the spaceship with wheels. 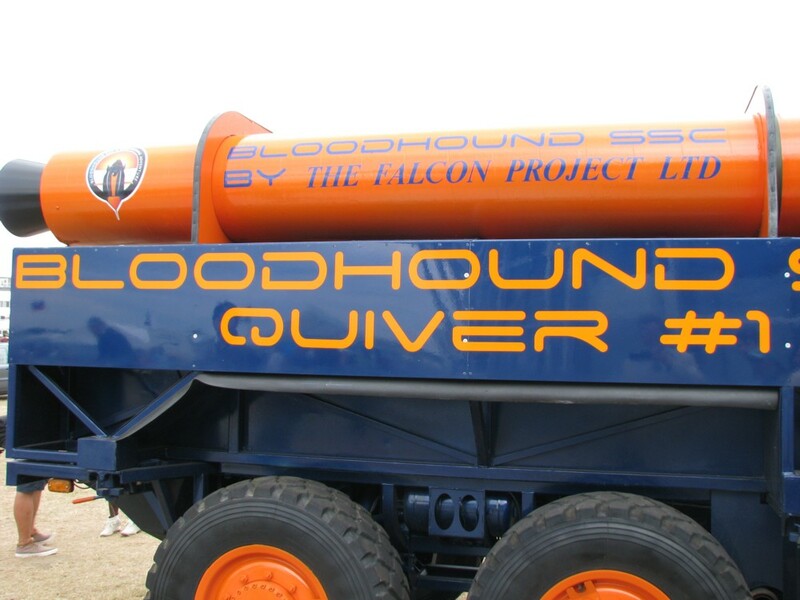 The Supacat carries the Falcons for the Bloodhound, which is why it calls itself the Bloodhound quiver. Clear? I think so. I’m still confused, however, about whether the “Falcon Project” linked to there is anything to do with this. I believe they’re two separate enterprises, but comments agreeing with that or disagreeing with that would be very welcome.